The Quay is a modern and luxurious boutique hotel in Phnom Penh which is innovative and original in its design. The hotel is very central, and within walking dsitance are many of the main sites such as the National Museum, theb Royal Palace, the Silver Pagoda, and shopping and entertainment districts of Phnom Penh. There are 16 rooms at The Quay. The rooms are all decorated with modern furniture and elegant touches, but designed in a way so as to not sacrifice comfort and luxury for modernity - all the rooms are extremely welcoming, and the 8 panoramic suites all have excellent views over the Mekong. We book the panoramic suites as standard. 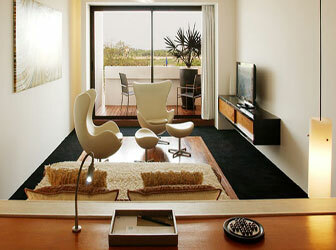 The rooms are all decorated with modern furniture but remains very tranquil and warm throughout. There is a very good restaurant which combines a whole range of Eastern flavours, and the facilities are all very new and innovative. The balcony views are wonderful. A lovely attribute to this hotel is the fact that although it is peaceful and intimate, the staff are friendly and fun and are very knowledgeable when it comes to visiting the town. "I stayed at the Quay hotel for the second time having stayed there around eighteen months ago; i was impressed yet again. The hotel is small with only sixteen rooms but that allows it to have a very welcoming atmoshere, that is not to say that quality is compromised but I felt like a genuinely valued guest by the excellent hotel staff. All staff from the cleaning staff to the management are smart, friendly and motivated, they know how to provide customer service. If you have never been there Phnom Penh is a brilliant but chaotic place, it was always nice to have a refuge and for that the Quay does an excellent job." Amanjaya Pancam a little further down Sisowath Quay.